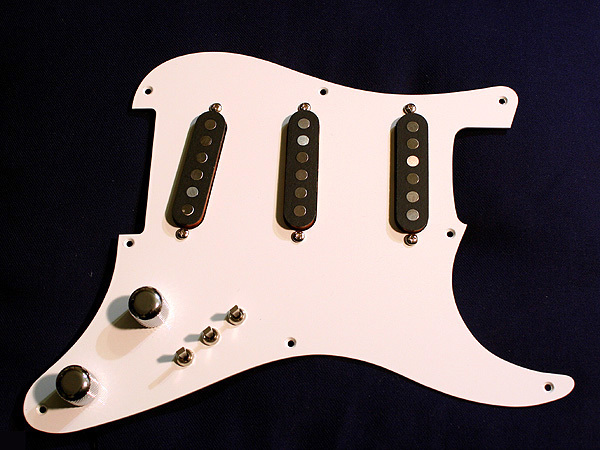 After the brass pickguards, the white ones are also available now. 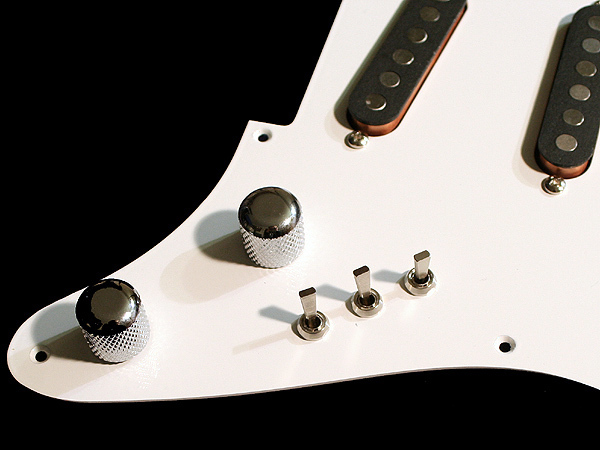 Just like on Mark Knopfler’s red Schecter Strat, they are made of white enamel aluminium, they feature three mini toggle switches, one volume poti and one tone poti with chrome or gold knobs (e.g. Mark Knopfler’s blue Schecter – played on stage by Hal Lindes – had gold knobs). Just two potis are great: you can finally rest your right hand closer to the bridge to get that funky, crisp attack like Knopfler. Probably there will be other pick-up choices (e.g. Seymour Duncans) available soon. Note however that with standard (= non-tapped) pick-ups you won’t get those 27 sound combinations. Here are some first pictures. Check it out in the shop. 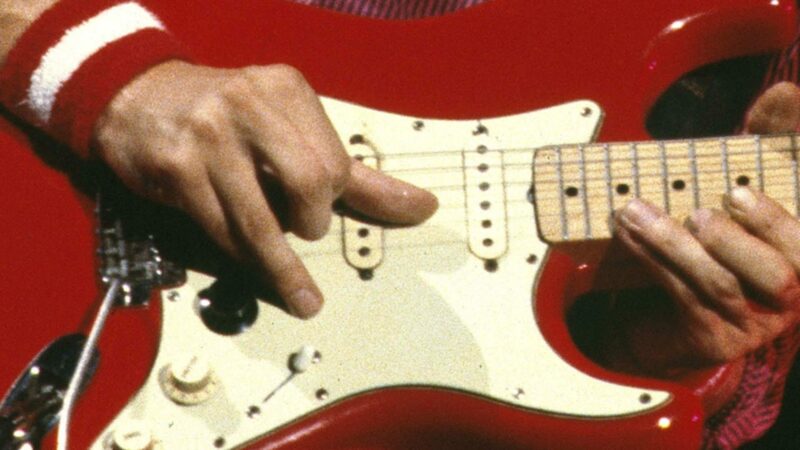 I dind’t realize it before you wrote it : when Mark changed the PU on his red schecter strat (mostly in early 81 ? ), he didn’t get those 27 sound combinations no more ? 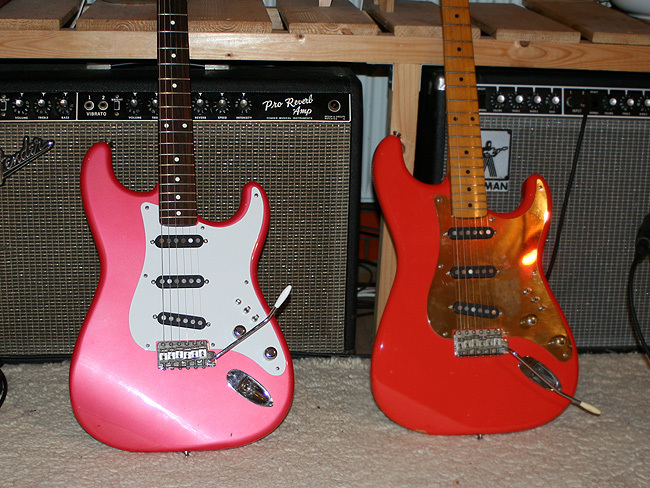 So, the question I asked about which songs he played with PU-full-coil concerned only late 80 for the red strat ? On Alchemy, and later, if he had the Seymour Duncan PUs, he didn’t have the possibility of choose between only one or two coils ? he only get one single coil on seymour duncan, right ? in this case what is the difference between the switch up or down ? 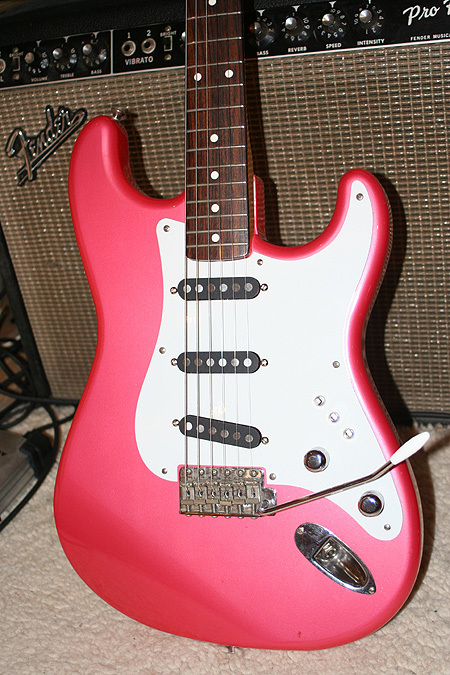 however, the sunburst strat kept the original PU, so e.g. Tunnel of love in 82-83 or 85-86 could be double coil ? And what for the schecter teles (black and red) did it have also tapped PU ? If so, tele tones in the 80’s could be double coil ? Just to add to your questions I notice that the pups are exposed coils is it possible to cover them in the conventional sense? Utterly fantastic job Ingo I can’t start to imagine what has gone into this. I will be saving my pennies for a white one. Regards PU-full-coil usage ..so far I’ve only seen the PU-full-coil used on the sunburst I think for parts of Telegraph road and Ride Across The River live on Ride the distortion is better on the PU-full-coil a bit akin to rolling off the tone on a std strat. On Tunnel Of Love whistle test 1980 version he seems to go from PU-half-coil neck-middle -> middle-> middle-bridge during the final playout solo so no PU-full-coil selected (as far as I can tell). Quote: Just to add to your questions I notice that the pups are exposed coils is it possible to cover them in the conventional sense? No, it is not possible, they are too wide, also the magnets are bigger and won’t fit through the holes in the cover which would loook odd anyway. And right, he lost those 27 combinations when he put it non-tapped pick-ups (those switches give you 7 sounds of all off then). Of course he got the luxury to have a dedicated guitar for each sound so he still got that fatter sounds with the sunburst. To me it looks as if he had the full coils (switch in down position, tapped is up position, center is off) on the late 1980 gigs (e.g. ToL on Whistle Test, Dortmund 1980, Boston 1980 etc.). For this reason I assume that he also played full coils a lot on the Making Movies album. With a non-tapped pick-up, I suppose there is no difference between the switch up or down ? Center is off, and up or down is On, right ? Yes, more than the 5 ones on a fender strat, but I find it’s more tricky to switch from a PU combination to another one. >>With a non-tapped pick-up, I suppose there is no difference between the switch up or down ? Center is off, and up or down is On, right ? I suppose it is rather off – off – on. 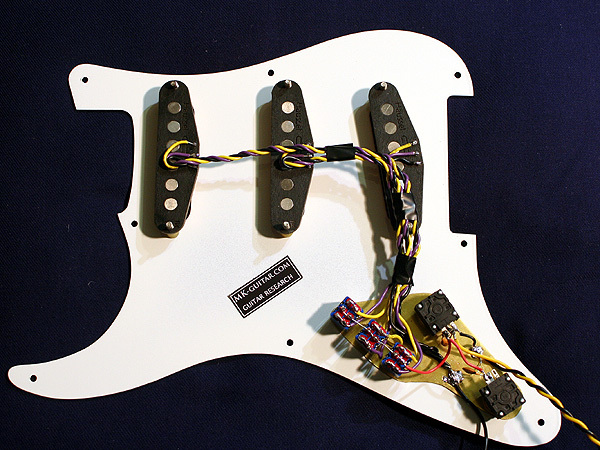 You need to bridge two connectors and you have on – off -on if you prefer it this way. You can also wire those switches in such a way that you can set any combination to out-of-phase, e.g. bridge up and middle down would be both out-of-phase, while both up or both down would be both in the normal parallel way. However, I don’t hear any out-of-phase sounds so he probably does not have it this way. Fantastic work Ingo! Maybe I’ll buy one as well. 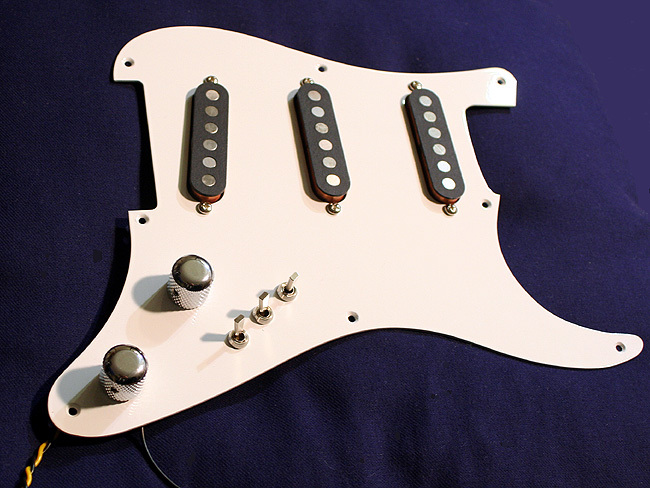 I’m very excited about these, I look forward to buying one once I start building a Dream Machine style guitar. I actually have a question you could probably answer, Ingo. 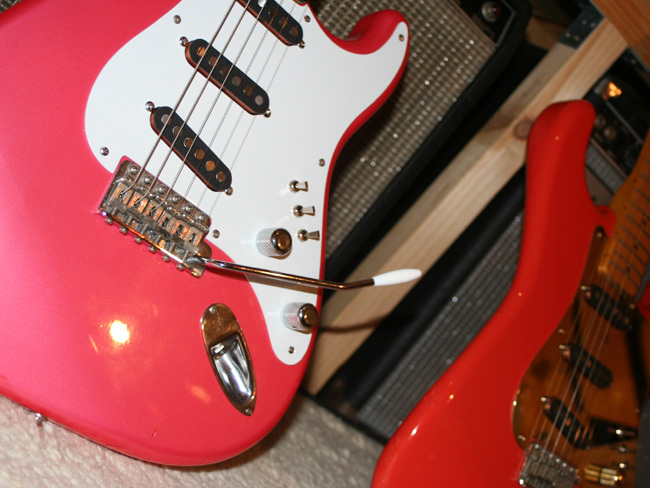 I was wanting to build a replica, of sorts, of Mark’s candy apple red Schecter with the F-500s. I was going to use ash, but I’ve recently heard the bodies on those red strats were actually mahogany. That makes sense to me, since Schecter’s were very dense, but I’m not sure if you’ve heard one way or another. Thanks! They were mahogany. I remember an interview with Tom Anderson or John Suhr saying he was worried they would end up sounding too ‘dark’ but they obviously sounded just right as Mark used the CAR as his number 1. Gunslinger, I wanted to quote that too, but I didnt because I couldn’t find the source. I think I read it on the Schecter Forum which is down nowadays. However, remember that Dream Machines were pretty much custom, many Dream Machines are unique. Same for the woods they used, it isn’t possible to say that a always was made out of a certain wood, say mahogany. I think this info came from the Tom Anderson forum. Schecter was a parts supplier, they were specialized on brass hardware and exotic or tropical woods. The late 70ies catalogue offered a choice of 17 (!!) body woods, so mahaogony was only one of many. Definitely, Schecter offered many woods for their Dream Machines. I’m just looking to determine what wood would function best with the F500s. I imagine that with an aluminum pickguard, a maple neck & fretboard, plus 500k pots, it might be best to go with a warmer wood like mahogany. I’m not certain, but Mark always got a great, sharp, sound off those strats, I’d just like to get in that ball park. Though, I’ll never sound like Mark, I do take some serious inspiration in tone from him. Great Work! Is there a possibility that there will be lefthanded versions available for order? Is the middle reverse wound? No lefthanded versions are planned, and the middle is not reverse wound.